I love otah and I love bread. 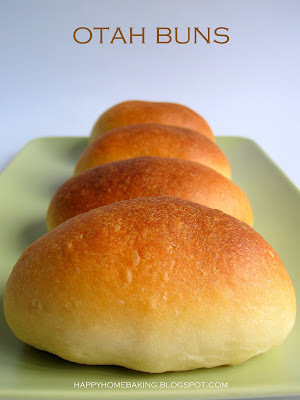 I wonder why it took me so long to get down to make some otah buns. For those of you who are not familiar with this local savoury snack, otah is made by blending fish paste with a mixture of spices such as chillies, garlic, shallots, turmeric, lemon grass and coconut milk. Morsels of fish paste are then wrapped in coconut leaves and grilled over an open charcoal fire. (Here's a great photo of otahs on a grill and a typical 'mobile' otah stall.) The wonderful aroma of otah sizzling over the grill is unbelievable. I steamed the pre-cooked otah and cut them into slices before wrapping it with the dough. On hind sight, I should have mashed the otah before using it as fillings. The bread turned out great, except that the otah was a tad too dry. It was the first time I tried this brand of pre-cooked otah, it was quite dense and it tasted almost like a chunk of fish cake :( I should have gone back to the usual brand which has got much softer texture and taste much better. Place all ingredients except the butter in the pan of the bread machine (according to the sequence as stated in the instruction manual of your bread machine). Select the Dough function of the bread machine and press start. After about 8mins of kneading add in the 50g of butter. Let the machine continue to knead the dough. After the kneading cycle has stopped (20mins), Stop and Restart the machine. Continue to let the machine knead for another 10mins. Leave the lid open while the machine is kneading. Stop the machine and remove dough from the bread pan. Shape the dough into a smooth round and place in a lightly greased mixing bowl. Cover bowl with cling wrap and let it rise till double in volume for about 60 ~ 90 mins. Remove dough and give a few light kneading on a lightly floured work surface. Press out the trapped air as your knead. Divide into 9 equal portions (about 60g each) and shape them into rounds. Cover with cling wrap, let the doughs rest for 10mins. Flatten each dough into a round disc and press out the trapped air. Wrap dough with otah fillings or any fillings as desired. Place doughs seams side down on a baking tray (lightly greased with oil or butter or lined with parchment paper). Space the dough well apart. Loosely cover with a damp cloth or cling wrap and let doughs proof for 45 ~ 60 mins or until double in size. Bake at preheated oven at 190 degC for about 15 mins or until the bread is golden brown all over. Remove from pan. Brush with melted butter if desired. Let cool on wire rack. hahaha... I like the last picture! It looks really cute and fun. 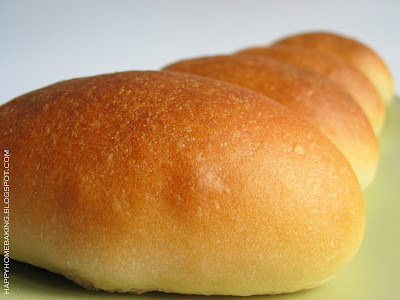 You baked very perfect buns, I wonder how you rolled the bun so smooth and nice. I love otah buns too. Though I can't really take hot and spicy stuff, I don't mind eating and puffing with sweat. Haha, exaggerating! Yours looks really delicious! Hi Grace, my kid helped me with the shaping, for rounds, we cup the dough in our hand and roll it on the table. As for oval, the trick is to pull the dough towards the seams to make the surface very smooth. If I have the chance I will try take a video to show you. I normally enjoy my otah at Mdm Kwan restaurant in KL. They are lovely. And your buns look lovely too. Very nice pictures and buns! Love the last photo, a bun race into your family's tummies! May I ask if I don't have a bread machine but a dough hook on my mixer, how long should I allow it to "knead" it for me? The face is very cute :). 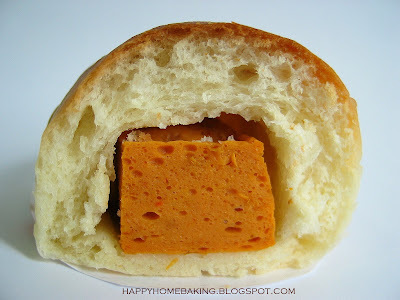 I've never tried otah before, it sounds savory and flavorful, I like the idea of having something to sink my teeth into in a bun :)! I'm not familiar w/ Otah, but it looks like a delicious treat. 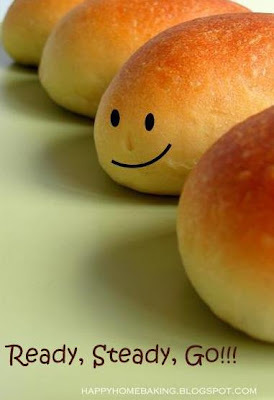 Your buns look so perfect! Hi CY, I am sorry I am not able to answer your question as I have not tried using a mixer to knead a bread. Thanks anyway HHB! I'll try try and see how long I need. Or I just might get myself a bread machine in the post-Christmas sales! Hi HHB, I am thinking of getting a bread machine. Would you mind telling me which brand are you using? Thanks alot. 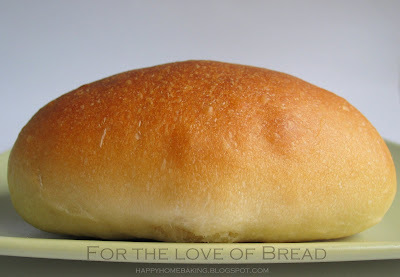 My next goal will be to make nice and fluffy bread. Hee hee. Wow this is yummy! U r very creative! I love you blog. You made these look THAT perfect with a "cheap" bread machine?! What kind of magician are you? You couldn't have taken better pictures. Everything is PERFECT. And I'm gonna have to research what this caster sugar is. Yum Yum! I love otah too. Won't be able to find any bakery out there that sell otah bread with such a huge chunk of otah. Hooray to home bakers! Hi HHB, your doodle is soooo cute! Why you don't use 100% of bread flour? I think the buns will be more softer if you use 100% of bread flour.Please advice. Thank you. Hi Michelle, I followed the original recipe which calls for a mixture of bread flour and cake flour. I am not sure what's the purpose of addition the cake flour...but I thought it could help to make the bread softer?? I'm sorry my knowledge in bread making is really limited, so I can't really answer your question, I hope you don't mind. Haha. Ok ok. Thanks. I shall go and take a look. I am still at the scouting stage. I would like to confirm this recipe use 125g WATER instead of MILK in the sweet buns recipe? Hi Mayvis, yes I used water instead of milk for this otah buns, as I was thinking it would taste better since I was using a savoury filling. Can you advice any difference in taste or texture of the bread replacing water with milk? Hi Mayvis, there is not much difference in the texture...but taste wise I can't tell...since the spicy taste of otah was quite overpowering. I would think milk will give the buns a nicer fragrance. Do u remember the brand of the otah that u prefer to use? Hi Kium, I'm sorry I don't remember it, I just finished one pack last week! I bought it from a stall in the wet market. This brand is not available at supermarkets. I tried making the bread yesterday. After 50 minutes of kneading, sweating all over, the dough is still sticky. I have to give up cos my son is late for his piano class, and I leave it there to proof. It did rise but it is still sticky. After baking, it tasted ok but this morning it is very hard. Hi agapejen, maybe there is too much liquid (maybe the amount of egg), as the original recipe only states 1 egg which may not be accurate. I use medium size egg (about 60-70g with shell). You may add some flour to the dough if it is still very wet. I think maybe you didn't knead the dough until it becomes smooth and no longer sticks to the work surface, so the gluten was not fully developed, as a result the bread turn hard the next day. I tried again yesterday, this time I managed to knead till it did not stick to my hand and it looks like the one in your pix. The bread tasted better, but this morning, it is still hard (though not as bad as the 1st batch). Should I knead more or let it proof longer? Also, it is possible to keep the dough and bake it the next morning? If it is possible, at which stage? after putting the fillings or after 1st, 2nd proof? Hi agapejen, I am not sure what went wrong, but I dont think you should proof it longer as over-proofing is not a good thing either. I have not tried keeping the dough until the next day so I am not able to comment on this. Maybe you can keep the bread in an air-tight container to prevent it from turning hard? My dough still bit sticky I have beat the dough with my kenwood chef for more than 1/2 hr. although added in extra flour. I let it to proof for 2 hours. Shaping the buns turned out messy but after baked, the buns very soft and nice. please advise where did I go wrong. Hi Anonymous, one of my extended family members uses Kenwood mixer to knead bread dough. She tried with different recipes and every time the doughs were still sticky after more than 30mins of mixing. She left the doughs to proof anyway and the bread still turn out ok, but she had problem shaping the bread as the doughs were sticky. We have been wondering what was the reason behind. I tried searching on the internet, the closest answer I could get is from here: (http://answers.yahoo.com/question/index?qid=20060725093123AAEgEOc), apparently, 'the dough gets sticky the longer you knead the dough in the mixer as water gets in the flour'. Another interesting article over here: (http://www.breadcetera.com/?p=9), do read the comments as well, it seems like a breadmachine does a better job in kneading the dough compared with a mixer. I do not have wet, sticky dough when I used my breadmachine in the past. And the best method for kneading a bread dough is till by hand! Hope this helps and do let me know if you are able to find a solution to the problem.